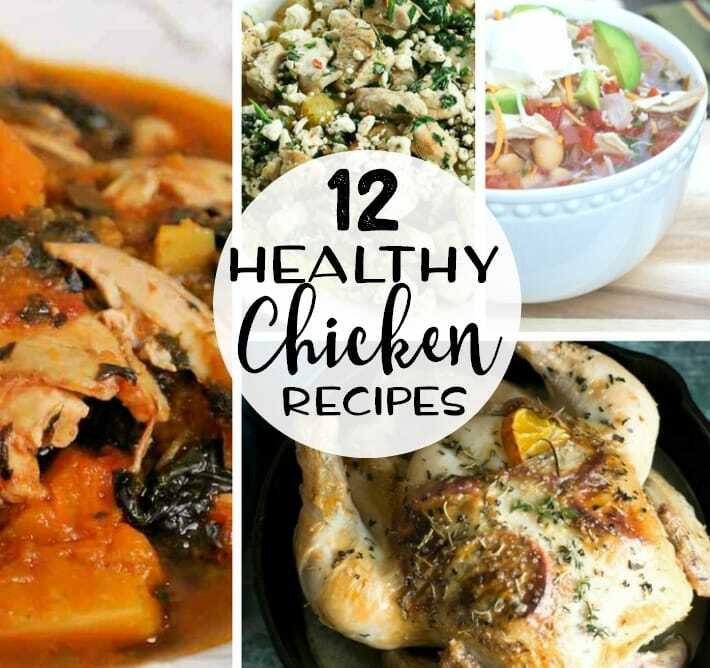 If you are looking for some new healthy Chicken recipes to cook for your family we have rounded up 12 healthy Chicken dinners for you to try. 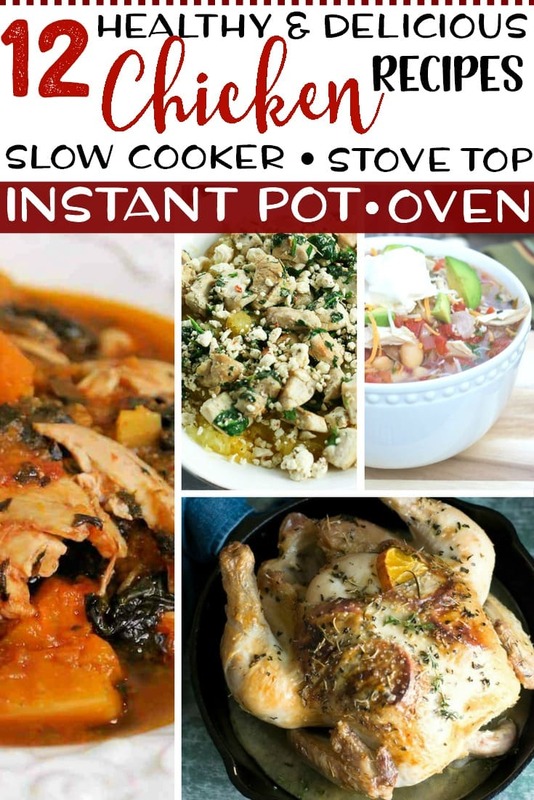 The list includes Chicken recipes for the slow cooker, Instant pot, oven and stove top. A great variety that allows you to make healthy meals at home. Slow Cooker Chicken Thighs with Butternut Squash and Spinach from Mom Foodie is a Whole 30 compliant meal that is so easy to make and is tasty and satisfying. Roasted Herb Chicken with Mandarin Oranges from Fearless Dining is moist and flavorful with garlic, fresh herbs, and sliced oranges. Slow Cooker White Chicken Chili from Thrifty Northwestern Mom is a Hearty Slow Cooker Meal for Busy Evenings with fresh salsa, chicken, white chili beans, chicken broth, garlic, fire roasted diced Chili’s and fresh cilantro. Easy Weight Watchers Garlic Chicken from Penny Pincher Jenny is one of those dishes that everyone will love. And leftovers are great on salads the next day. Garlic Mustard Chicken and Potatoes in the Airfryer from Recipe This is Whole 30 compliant and you get to enjoy truly crispy chicken thighs with skin on garlic potatoes perfectly cooked in the Airfryer. Cajun Slow Cooked Whole Chicken from A Sprinkling of Cayenne is slow cooked with the Cajun ‘trinity’ of onions, green bell peppers, and celery plus sweet potatoes to make it a one-pot meal full of flavor. Mediterranean Spaghetti Squash Bowl with Chicken and Spinach from Healthy Happy Mama is a delicious and healthy meal that is quick with Spaghetti Squash, chicken, spinach, and feta cheese topped with a red wine vinaigrette. Chinese Simmered Chicken from This Old Gal is cooked in a spicy sweet sauce in a pressure cooker or Instant pot for dinner in less than 30 minutes! Parmesan Crusted Chicken Breast from Grace Filled Plate is super easy to make. All it requires is simply dredging the chicken in parmesan and sautéing. Serve with your favorite sides or salad. Nutmeg Orange Chicken from Recipes from a Pantry is suitable for people following a paleo, keto or low carb diet. The chicken is roasted with orange juice, olive oil, garlic, nutmeg, allspice, ground cloves and salt. Chicken Tenders and Parmesan Zucchini Fries from Deliciously Plated is a simple and nutritious meal you can make at home using fresh organic chicken tenders with a side of very healthy and yummy Zucchini fries. Instant Pot Salsa Chicken from The Holy Mess is ZERO Points with the new Weight Watchers Freestyle Points system so it’s perfect if you are looking for diet friendly meals. Leftovers are great in Mexican bowls, taco salad, or chicken tacos.